Going to a marijuana dispensary is an experience. And like anything else, it has certain rules of etiquette that you need to follow to make the most of the experience. Whether you’re an avid user or a curious third party, the marijuana industry in Florida is growing. About 50,000 Floridians have registered to use medical marijuana, and there are 21 approved dispensaries across the state. Before you visit one of them, you need to know some ground rules. Here are 10 of them. No dispensary is exactly the same as another. It’s not exactly Target. So, let’s say you’re looking for a dispensary. Let’s say you’re a hypothetical Californian, and you’re looking for Los Angeles dispensaries. Where does the discerning buyer begin their journey? For example, not all dispensaries are medical. Some are recreational, or a combination thereof. So if you don’t have a card that shows you can legally buy medical marijuana, you won’t be able to buy from a medical dispensary. Do your homework. Know what you’re walking into. And on that note, know the rules before you embarrass yourself (and your budtender). The big one? Bring your ID. Even if you’re eighty years old and look it. Most dispensaries, both recreational and medical, are subject to incredibly strict laws under local governments. This isn’t like buying weed from a friend in college – dispensaries can’t and won’t sell to you if you don’t have your ID. You may also need to bring your medical authorization papers if you’re visiting a medical seller. As a rule, better safe than sorry – read up on your local seller’s rules before you give them a visit. Next step? Make sure you know what strains you’re looking for, or at least have a general idea. Are you shopping for medicinal purposes, or for fun? Do you want edibles, concentrates, vape cartridges? It’s not just knowing what form of the strain you’re in the market for. You should also know the basics of different kinds of strains. They all work a little differently, and while your budtender will be happy to help with your learning process, you should have the basics covered. If your dispensary has an online menu, this is a great starting point. And while we’re on the subject of budtenders, be polite to yours. 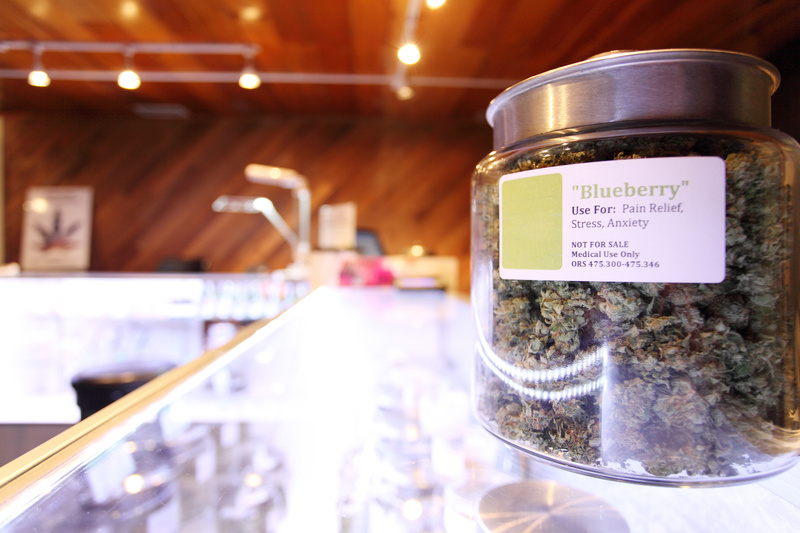 Budtenders are sort of like the marijuana equivalent of a bartender – thus the title. Essentially, they’re your best friend when you go to buy weed. A budtender is usually the first impression a customer gets. They’re the one who will be able to tell you all about the strains available for purchase, the difference between the types, and what you can expect from each type. It’s their job, and they’re a professional. This isn’t a drug deal. Be polite to your budtender. On the subject of politeness: bring cash when you go on your visit. While plenty of dispensaries have ATMs on-site, most dispensaries are still cash-only. If you try to pay with plastic, you’re likely to be turned away. Don’t bring a measly $5 either. Like we said, this isn’t like buying weed in a college dorm room. The cost of marijuana depends on what you’re buying and where you are, but in general, an eighth of a marijuana flower is about $40, and a pre-rolled joint is $10. This is another reason why you should do your homework before you go to buy – you should be able to take a look at prices on the website. If you haven’t gotten the memo yet: do your homework. You should know what you’re looking to buy before you even set foot in a dispensary. Not just whether you want to buy CBD oil or edibles. You should know how much weed you want to purchase. You should know what a gram of weed looks like, and how much you actually need. Don’t be that guy or gal who strolls in just before closing time with no clue in the world what you want. Your budtender will hate you on principle. If you’ve been confused thus far on what the difference is between an eighth of a flower and an edible, you have your next homework assignment. Know what types of consumption methods there are, and what you’re interested in. There are a variety of ways to consume marijuana, depending on the effect you want and what experience you’re looking for. A wise word to the beginner: be wary of edibles. Edibles are loosely defined as any food containing cannabis. Which is why you’ve heard of pot brownies. As a rule, edibles can take between half an hour to an hour to kick in, and the high can last for several hours. They’re much more concentrated than smoking, so take it very slowly – take a nibble and go from there. This is along the lines of politeness. Also, since this is a legal marijuana seller and not your college pot dealer’s basement. It’s a place of business. So you’re not going to consume marijuana on-site. At a minimum, you’ll be asked to leave – at worst, you could get ticketed. Don’t be that rude stoner. Go home before you start making use of the product. It is tempting to have lab results be your single go-to factor when you buy, lab results don’t tell you everything. For example, they won’t tell you to cure quality. They also won’t tell you anything about taste – some people love Girl Scout Cookies, others don’t. When all else fails, ask your budtender. Good budtenders will know how to recommend a good strain. If you take nothing else away from this list, take this one. Don’t be obnoxious. The usual standards of obnoxiousness apply – don’t be that person who’s surgically attached to their phone. Don’t be loud, or bother other customers. Have some consideration. Put your phone away and be polite. We work tirelessly to make sure our readers have answers to all their pressing questions. For more on dispensaries, check out our post on how to find the best dispensary in your area. If you have a question we haven’t answered, head to our contact page to let us know.